If you grew up in the country, this life is your normal. It's only when you have a city visitor or hear a disparaging remark about rural living, that you realize the stereotypes and misunderstandings held by urbanites. When the parents of our Fresh Air child visited, they were afraid to be left alone upstairs in my parents' home. 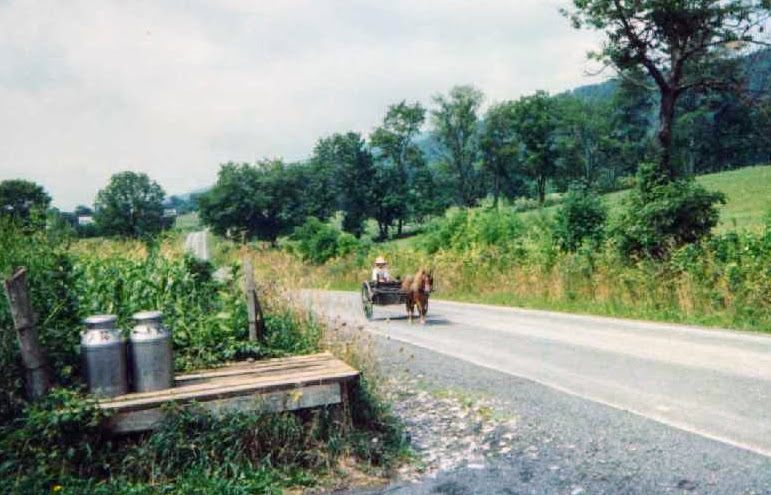 Another time my 6'5", 300-lb Philly visitor was afraid to get out of the car on the country roads in Big Valley. The cliche characters in movies and on television make us look like mouth-breathing, inbred ignoramuses. I'd like to straighten out a few matters. We may not have cable TV, but we do have satellite dishes. We have high-speed internet and actually know how to use computers. You actually can leave your keys in the car, and your front door unlocked, although we feel safer locking up at night. You can walk around freely on back roads, and nobody will try to shoot you or take you prisoner. Most of us are not inbred, though I do have some distant relatives who married first-cousins. Also, they say the Amish need to expand the gene pool a little. You do find some crappy houses around here, but they are interspersed with fine homes. Neither party minds. There are no zoning rules. We have quite a few junk yards and used car lots. This is the land of the free. I happen to live next to a junk yard, and the dogs are very nice. We mostly have fresh air, but manure is not what it used to be. These days it is a condensed, liquefied, pungent, eye-watering substance that is usually spread during a holiday backyard barbecue. If you think it's cheap to build in the country, think again. A sand-mound septic system and well will set you back many thousands of dollars, and you can't subdivide with less than an acre of ground to build on. I can count on 1 hand the number of times a stranger has rung my doorbell in 11 years. We have lots of deer, some bears, and gazillions of ground hogs. I haven't heard of them attacking anyone yet.